Purpose: To report a case of underlying regional metastatic ciliary body Medullioepithelioma who presented with trauma completely unaware about the dire consequences. Observations: A child presented to the OPD with subtle blunt trauma in the left eye following which lens rupture and iris neovascularization was noted. Due to juxtaposition of tissues in the anterior chamber to the ciliary body, there had occurred masquerade of various intra ocular conditions which came into notice after the patient had presented with trauma. Underlying ciliary body mass detected on table followed by MRI and histopathology had confirmed the diagnosis. Conclusions and importance: There is no standard treatment for metastatic intraocular medulloepithelioma. 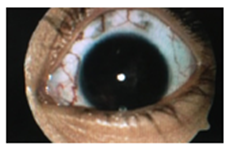 Early diagonosis and treatment led to regression, allowing enucleation and preventing further extrascleal spread. Small medulloepitheliomas often go undetected due to anterior placement of iris. Even after symptoms develop, clinical suspicion of tumor is often overlooked due to wide variation in presentation. Medulloepitheliomas being slow-growing tumors are not visible until they enlarge enough to protrude into the pupil, distort the iris, or invade adjacent tissues.1 The decreased vision in medulloepithelioma are due to subluxation and dislocation of the lens with cataract formation. With subsequent ciliary body epithelium involvement, the aqueous production is hampered, leading to signs of glaucoma as well as hypotony. Acquired tumors of the nonpigmented ciliary epithelium are classified as adenomatous hyperplasia (Fuchs adenoma), adenoma, and carcinoma.2 Surgical enucleation is considered standard therapy for intraocular medulloepithelioma after a diagnosis is established. Extrascleral extension occurs in 10-19% of cases4 and carries a poor prognosis often leading to metastasis at various sites and death. We present a peculiar case of a patient presenting only with loss of vision following blunt trauma with underlying non-teratoid regionally malignant medulloepithelioma which metastasised to the cervical and sub mandibular lymph nodes that presented only with trauma and was completely unaware about the diseased condition. The diagnosis of an underlying tumor was only made subsequently. Due to the peculiarity of the tumor presentation, diagnosis is often delayed. A healthy 4-year old girl presented with blunt trauma injury to her left eye by falling off the staircase following which she reported to the OPD on November 2014 (Figure 1). On examination, the patient had Perception of light, lens substance was dislocated and pushed posteriorally, iris rupture with neovascularization was noted while only the temporal pupil was reacting to light. The cornea was clear bilaterally. Due to significant media opacity, the posterior segment examination was deferred clinically by bio microscopy and a USG B-scan was advised. Examination of his right eye was clinically sound. He presented with no systemic ailments or any significant previously treated medical or ophthalmic history. 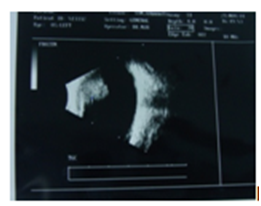 Figure 1 On USG B scan, lens matter was seen displaced into the anterior part vitreous cavity, with loss of posterior capsule integrity. On USG B scan, Posterior capsule integrity seemed lost, with lens matter in anterior part of vitreous cavity and retina was attached (Figure 2). On November 24, the child was undertaken for a Pars Plana Lensectomy and vitrectomy. On table a mass was seen extending from the ciliary body circumferentially and a biopsy was taken. 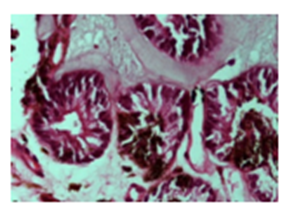 Histopathology reports revealed cluster of some round and epithelial cells. Cells were basophilic and pleomorphic and showed some pigmented cells also (Figure 3) (Figure 4). Figure 2 Biopsy of iris tissue showing cluster of round and epithelial cells. Figure 3 Giemsa stain revealed basophilic cells showing pleomorphism. 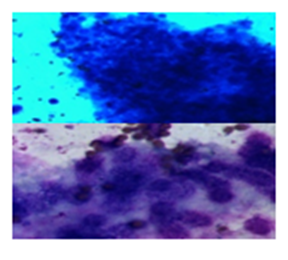 Figure 4 Giemsa stain revealed basophilic cells showing pleomorphism. Post operatively, MRI was advised of brain and orbit and it revealed a residual mass extending into anterior and lateral aspect of the globe (Figure 5). Regional metastasis to the cervical and sub- mandibular lymph nodes were noted and it nearly confirmed the diagonosis. Figure 5 MRI of the orbit showing extension of mass into anterior and lateral part of the globe. 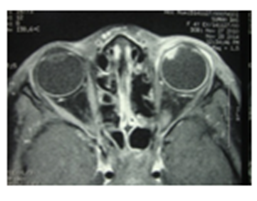 Due to histologically malignant features and a radiological confirmation, an enucleation of the left eye was planned under GA (Figure 6). There occurred no recurrence in the subsequent follow up visits and patient was doing well and thus, this trauma prevented the further dire consequences of a Medulloepithelioma. 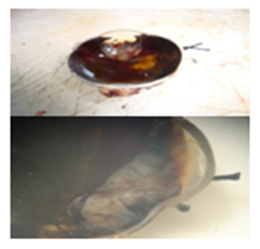 Figure 6 The gross specimen of the enucleated eye showing the ciliary body mass. This case highlights medulloepithelioma of the ciliary body in a 4-year-old child which masquerades as a dislocated lens matter along with neovascularization. The presenting complain of an ipsilateral blunt ocular trauma was initially assumed to be responsible for the diagnosis of dislocated lens with subsequent secondary inflammatory pain. Ciliary body medulloepithelioma being the commonest ciliary body neoplasm in childhood,6 the term “medulloepithelioma” was coined in 1930s by Grinker. It is thought to arise from the undifferentiated medullary tissue of the embryonic retinal pigment epithelium destined to form the nonpigmented ciliary body epithelium subsequently after birth. It is most commonly found at the ciliary body.6 It can have a presentation of a benign or malignant like condition or may also exhibit teratoid features. Due to the close juxtapostioning of the tumor to the intraocular contents complications such as cataract, ectopia lentis, secondary rubeotic iris may present former to ciliary body mass presentation. Most commonly involved structure is the lens and can present with a manifold of lens-related pathological entities such as a lens opacification, lens notching (referred to as a “lens coloboma”) and ectopia lentis.6 Thus, when noted a coloboma of lens without associated coloboma of uveal tissue and optic nerve head should prompt an underlying ciliary body medulloepithelioma. Given the presenting history of an ipsilateral blunt ocular injury in our case, the initial diagnosis of a traumatic cataract was very rational. The pre operative observations of iris tissue neovascularization with cysts on table might possibly have suggested of an underlying neoplastic process. With an earlier clinical diagnosis of an underlying neoplastic condition, the pars plana lensectomy would not have been the probable treatment of choice. Surgical removal of the tumor thus provided a definitive histological diagnosis with a cluster of basophilic cells showing pleomorphism. The characteristic rosettes and fleurettes of retinoblastoma maybe seen ocasionally but retinoblastoma have an eosinophilic content on contrary to medulloepithelioma. The final call for enucleation of the diseased eye is usually based on a painful eye with poor visual potential, and a strong clinical suspicion of malignancy showing voluminous tumor growth. The ciliary body medulloepitheliomas being locally invasive, complete excision is curative and associated with a good disease free survival. In our case, due to an early diagnosis the local scleral and extra scleral invasion of the tumor was hampered, thereby not necessitating the need for adjuvant chemotherapy after enucleation. On conclusion, the differential diagnosis of an intraocular neoplasm should be considered when a child presents with a masquerade of severe chronic uveitis associated with cyclitic and fibrotic membranes, with other features of IOP alteration. An ultrasound biomicroscopy should be carried out to exclude a ciliary body neoplasm due to a posterior location of the ciliary body which is manner times missed on a conventional USG B-scan. Robert M Verdijik. On the classification and grading of medulloepithelioma of eye. Ocul Oncol Pathol. 2016;2(3):190–193. Singh A, Singh AD, Shields CL, et al. Iris neovascularization in children as a manifestation of underlying medulloepithelioma. Journal of Pediatric Ophthalmology Strabismus. 2001;(38):224–228. Hellman JB, Harocopos GJ, Lin LK, et al. Successful treatment of metastatic congenital intraocular medulloepithelioma with neoadjuvant chemotherapy, enucleation and superficial parotidectomy. Am J Ophthalmol Case Rep. 2018;11:124–127. Shields JA, Eagle RC, Shields CL, et al. Congenital neoplasms of the nonpigmented ciliary epithelium (medulloepithelioma). Ophthalmology. 1996;103(12):1998–2006. Chua J, Muen WJ, Reddy A, et al. The Masquerades of a Childhood Ciliary Body Medulloepithelioma: A Case of Chronic Uveitis, Cataract, and Secondary Glaucoma. Case Rep Ophthalmol Med. 2012;2012:493493. Campbell RJ, Sobin LH. Histological Typing of Tumours of the Eye and Its Adnexa. Berlin: Springer; 1980. 82 p.
© 2018 Agarwalla et al. This is an open access article distributed under the terms of the Creative Commons Attribution License , which permits unrestricted use, distribution, and build upon your work non-commercially.